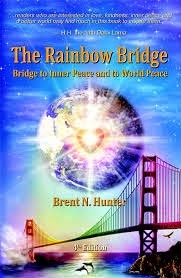 Brent Hunter's "The Rainbow Bridge: Bridge to Inner Peace and to World Peace" is a thoughtful book that shows readers how to build and cross the rainbow bridge, out of the current world full of poverty and violence to the other side where love, peace, cooperation, unity, and harmony abound. It also tells us why it is so important to abandon an egocentric mentality for the higher ground of compassion, service, and love for others because "we are all one," we are infinite beings in an "infinite cosmos." Everything is interconnected. "The Rainbow Bridge" discusses the common ground across wisdom traditions using sixty universal principles that are boiled down to their most practical forms and applications. Hunter also provides pertinent examples for our modern day culture, as well as quotes that you will cherish and want to reflect upon. Even though the notion of the rainbow bridge is still in the process of becoming mainstream, Hunter clearly expresses the salience of the rainbow bridge to our time and place with his 14-point roadmap to world peace. Some key goals include: the elimination of nuclear weapons and terrorism, the formation of a global commons and global operating system, and the encouragement of more global dialogue in various shapes and forms. However, before we step outside ourselves to fight against war and poverty, we must come to know ourselves and realize the power of introspection, visualization, meditation, and prayer, as well as the power of kindness - treating others as we would like to be treated ourselves (The Golden Rule). The author's work in this 4th edition is commendable in his content, style, and delivery. The book reads very well, and the universal principles are user-friendly, straightforward and thought-provoking. This is a book to truly cherish because it is a book about finding one's inner peace and purpose so that we can all work together towards world peace, crossing the rainbow bridge together when our time comes.